Our cherry treat-inspired Frappuccino® Blended Beverage blends milk, ice and cherry flavored syrup. 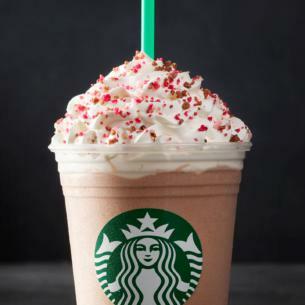 Topped with whipped cream and cocoa Valentine sprinkles, it's love at every sip. **Each caffeine value is an approximate value. Ice, Milk, Crème Frappuccino Syrup [Water, Sugar, Salt, Natural And Artificial Flavor, Xanthan Gum, Potassium Sorbate, Citric Acid], Whipped Cream [Cream (Cream, Mono And Diglycerides, Carageenan), Vanilla Syrup (Sugar, Water, Natural Flavors, Potassium Sorbate, Citric Acid)], Mocha Sauce [Water, Sugar, Cocoa Processed With Alkali, Natural Flavor], Cherry Syrup [Water, Sugar, Natural Flavor, Malic Acid, Potassium Sorbate], Valentine's Sprinkle [Sugar, Cocoa (Processed With Alkali), Natural Flavor, Beet Juice Concentrate, Turmeric (For Color), Fruit And Vegetable Juice For Color (Apple, Cherry, Purple Sweet Potato, Radish)]. See ingredient and allergen information below. Nutrition information is calculated based on our standardized recipes. Because our beverages are handcrafted and may be customized, exact information may vary. Nutrition information is rounded in accordance with U.S. FDA regulatory requirements. Caffeine values are approximate and are based on limited analytical data using standard brewing methods. Caffeine values can vary greatly based on the variety of the coffee and brewing equipment used. We cannot guarantee that any unpackaged products served in our stores are allergen-free because we use shared equipment to store, prepare, and serve them. Customers with allergies can find ingredient information for products on the labels of our packaged products or online at Starbucks.com/menu.